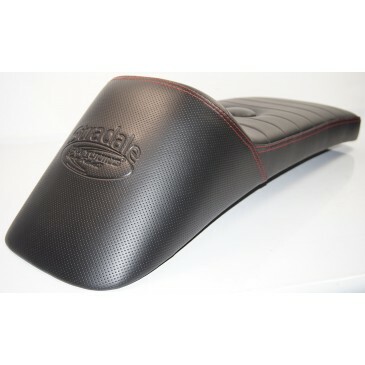 High Quality PM Stradale seat handmade by craftsmen here in the UK. Heavy duty GRP seat base with high grade groove welded vinyl. Double red contra stitch with blind perforated material, embossed Stradale/ PM logo to the slope back part of the seat , removable round upholstered fuel bung completes the overall sleek design. This seat has been specifically designed for the wider Scomadi TL/TT/RA-GT body, comes complete with brackets and all fitting hardware. Not to be confused with narrower Lambretta seats currently available. The PM Stradale sport seat has been designed to be bolted into position using a special under carriage bracket fixing kit. Two rear rack and two of front two seat fixing nuts need to be drilled through to clear the threads using an 8.5-9mm drill to allow the fixing bolts to be secured from the underside of the frame with washer and nuts provided.